Rocco Romano was born January 23 in Hamilton, Ontario. He joined the Calgary Stampeders in 1987 as a fifth rough draft choice out of Concordia University. After spending the 1987 season in Calgary, he was traded to the Saskatchewan Roughriders and later signed with the Toronto Argonauts. He spent the 1989 season with the Ottawa Rough Riders, moved on to the BC Lions for the 1990 and 1991 seasons before being dealt back to Calgary in 1992, where he would spend the final nine seasons of his career. During his career in Calgary, Romano was the West Division’s nominee as the CFL’s Most Outstanding Offensive Lineman in 1994 and 1996. He played in 14 postseason games and appeared in the 1992, 1995, 1998, and 1999 Grey Cup games. He was a member of Calgary’s 1992 and 1998 Grey Cup championship teams. 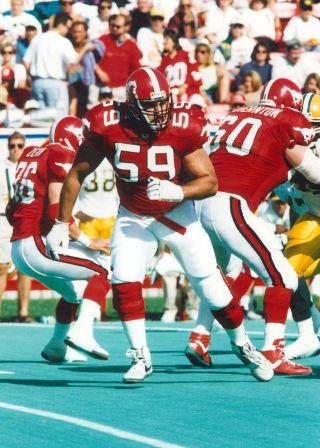 Romano won the President’s Ring in 1997, an award bestowed by Stampeder teammates to the player deemed to have exceptional motivational and leadership skills on and off the field. He has been involved extensively in Calgary community causes including the recruitment of local business to purchase tickets that he distributes through Rocco’s Kids.